Research shows when employees contact your call center, more than 30 percent of their problems relate to passwords specifically. Forgotten passwords and password resets are the #1 help desk request. Although it is a relatively simple problem for a call center technician to fix, each one of these requests will result in an average loss of around $30 to a company when labor time is factored into the equation. That number is much greater if an employee is put on hold for an extensive period of time, or worse, they are stationed internationally and because of time differences they cannot get through to the technician for several hours. Plus, every easy-to-fix call of this type takes attention from more important problems. Instead of flooding your call center with employees needing a password reset, implement Avatier Identity Management Software (AIMS) at your company. AIMS features Password Station, which allows your employees to securely perform a password reset, without the help of a technician. For remote workers by simply calling an RSA SecurID phone line, business users can reset their passwords in minutes. Avatier Identity Management Software (AIMS) works on almost any platform and can be administered in 30 different languages. 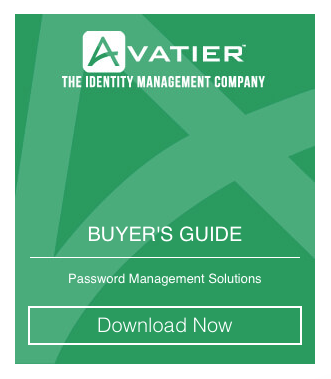 To learn more about how much your call center can save through enterprise password management and self-service password reset tools, contact an Avatier representative today.